Jeff Sullivan, left, as J.M. Barrie, and Conor McGiffin as Captain Hook appear in “Finding Neverland” at the Schuster Center in Dayton through Sunday. DAYTON — Victoria Theatre Association presents the enchanting Broadway musical, “Finding Neverland,” through Sunday, Jan. 20, at The Benjamin and Marian Schuster Performing Arts Center in downtown Dayton. Tickets, from $26 to $99, are on sale at 888-228-3630 and online at www.ticketcenterstage.com. Based on the Academy Award-winning Miramax motion picture by David Magee, and the play, “The Man Who Was Peter Pan,” by Allan Knee, “Finding Neverland” follows the relationship between playwright J.M. Barrie and the family that inspired Peter Pan, or The Boy Who Wouldn’t Grow Up — one of the most beloved stories of all time. Diane Paulus’s “Finding Neverland” with direction recreated by tour director Mia Walker and associate choreographer Camden Loeser, with book by Olivier Award-nominee James Graham, music and lyrics by Gary Barlow and Grammy Award-winner Eliot Kennedy and original choreography by Emmy Award-winner Mia Michaels, is packed with mesmerizing visuals, irresistible songs and plenty of laughs. It is a timeless story about the power of imagination, and spectacular proof that you never really have to grow up. The production features scenic design by Tony Award-winner Scott Pask, lighting design by Tony Award-winner Kenneth Posner, costume design by Suttirat Larlarb, sound design by Shannon Slaton, hair and make-up design by Bernie Ardia, projection design by Jon Driscoll, music supervision by Fred Lassen, musical direction by Patrick Hoagland, illusions by Paul Kieve and air sculpture by Daniel Wortzel, animal direction and training by William Berloni and casting by Stewart/Whitley. https://www.sidneydailynews.com/wp-content/uploads/sites/47/2019/01/web1_Neverland.jpgJeff Sullivan, left, as J.M. 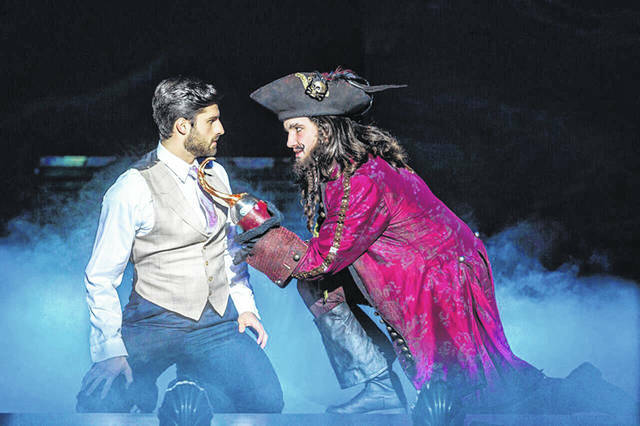 Barrie, and Conor McGiffin as Captain Hook appear in “Finding Neverland” at the Schuster Center in Dayton through Sunday.